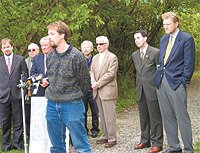 Recently the River Revitalization Foundation (RRF) joined Mayor Norquist, Metropolitan Milwaukee Sewerage District (MMSD) Director Kevin Schaefer, other City and County officials in Gordon Park to announce the MMSD Greenseams program purchase of an easement on the Beer Line Bike Trail. Gordon Park is the trail head. MMSD Greenseams is a land acquisition program whose goal is to insure that the watershed of Milwaukee’s Rivers have adequate green and protected adjacent areas to minimize direct runoff into the waterways. The goal is to provide “green seams” along the rivers. This is the first purchase for the Greenseams program. This easement provides the final monies needed to buy this section of railroad right of way. The land cost $400,000. A Knowles Nelson Stewardship grant provided the first $200,000, MMSD Greenseams $150,000, with $50,000 coming from the Greater Milwaukee Foundation and Maihaugen Foundation. RRF’s executive director, Kimberly Gleffe, coordinated the fund raising effort. The land is now owned by the Foundation with plans to turn over the land to Milwaukee County Parks. MMSD’s Schaefer noted that the purchase will keep this land as green space in perpetuity. This is one more step towards maintaining an existing green corridor for much of the Milwaukee River valley upstream of North Avenue. It will link Riverwest with a pedestrian and bike trail to the river valley, a footbridge at the former dam, a hiking trail on the east side of the river, new trails in Kilbourn Park, a bike and pedestrian bridge under the Holton Street bridge as well as downtown and the Riverwalk. Many of these trail additions should be completed by next year. Alderman Mike D’Amato, Milwaukee County Supervisors Willie Johnson Jr. and Gerry Broderick, RRF’s Gleffe, and others will be meeting in late November to discuss proposals to finish the trail connections near North Avenue that involves City, County, and private land.